Finally, there is a one-stop reference book for the petroleum engineer which offers practical, easy-to-understand responses to complicated technical questions. This is a must-have for any engineer or non-engineer working in the petroleum industry, anyone studying petroleum engineering, or any reference library. 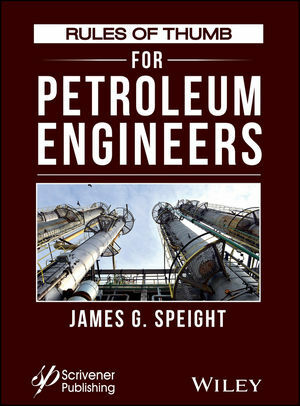 Written by one of the most well-known and prolific petroleum engineering writers who has ever lived, this modern classic is sure to become a staple of any engineer’s library and a handy reference in the field. Whether open on your desk, on the hood of your truck at the well, or on an offshore platform, this is the only book available that covers the petroleum engineer’s rules of thumb that have been compiled over decades. Some of these “rules,” until now, have been “unspoken but everyone knows,” while others are meant to help guide the engineer through some of the more recent breakthroughs in the industry’s technology, such as hydraulic fracturing and enhanced oil recovery. The book covers every aspect of crude oil, natural gas, refining, recovery, and any other area of petroleum engineering that is useful for the engineer to know or to be able to refer to, offering practical solutions to everyday engineering problems and a comprehensive reference work that will stand the test of time and provide aid to its readers. If there is only one reference work you buy in petroleum engineering, this is it.